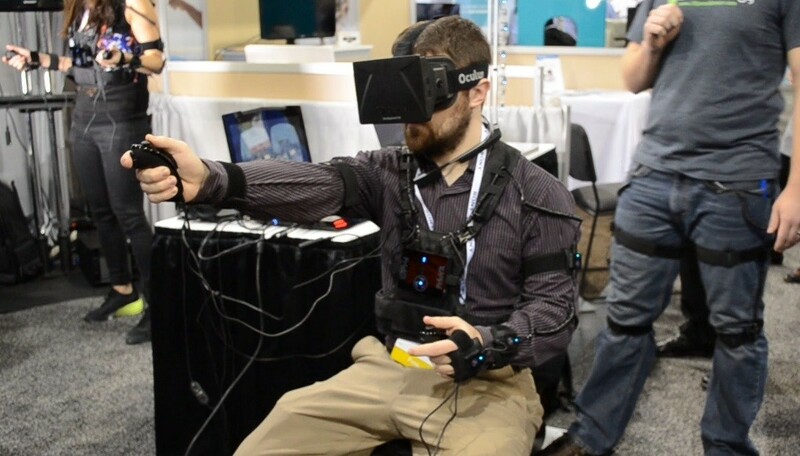 At CES 2014 Road to VR caught up with YEI Technology, the company behind the PrioVR virtual reality motion input suit. We interview Paul Yost, head of development at YEI, to get the latest on this exciting system. PrioVR will be re-launching a Kickstarter next month. 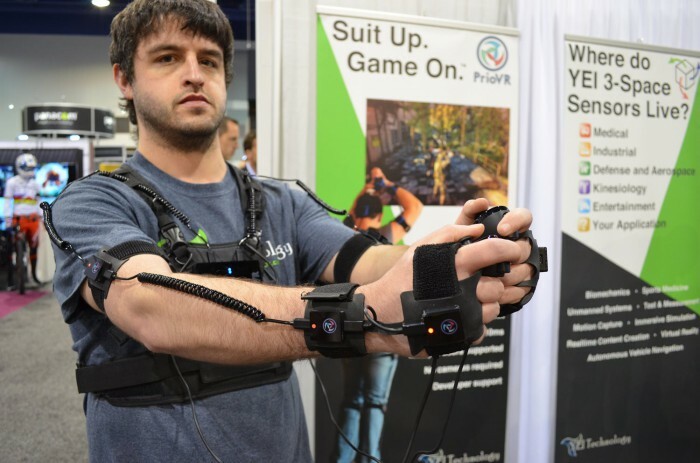 For those just joining in, PrioVR is a full body virtual reality motion input suit. YEI Technology took the system to Kickstarter back in September but was only able to raise about half of their $225,000 funding goal. The team has since continued work on PrioVR to help meet feedback from the Kickstarter, and plans to relaunch a crowd-funding campaign on February 14th. 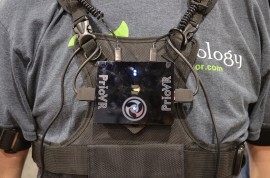 After having seen the first PrioVR prototype, I was excited to get my hands on what Paul Yost, head of development at YEI, called an “advanced prototype” of the system. The wireless hub is now part of the system, mounted across the sternum. The keystone of the system, it holds the battery and manages the suit’s wireless communication. Speaking of batteries and wireless, Yost told me that the system could potentially have a range up to 1000 feet—longer than a football field! He also mentioned that the current system is running for around 8 hours, even before optimization. With optimization, they expect to hit their 10 hour battery life target. The suit has changed somewhat since the initial prototype, moving from a leather material to mesh. The sensors are still attached around the arms with velcro and some finger loops on the hand—Yost told me that YEI is working with designers to make the system more ergonomic. They’re considering a drop-in hub setup where you simply slide the hub into a dock mounted on the chest, making all of the connections without needing to plug in anything (the current prototype has four plugs going into the hub). 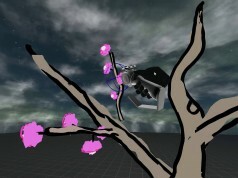 Hand controllers have also been added to the system. These are small one-handed controllers, like the Wii-nunchuck, with analog sticks and buttons. YEI realized early on that a controller would be an important part of the system, but hadn’t shown it in their initial Kickstarter, to the dismay of some would-be backers. I suggested that the suit should include holsters for the controllers, giving players not only a convenient place to store them when they are suiting up, but also offering some cool in-game possibilities for weapon holstering. 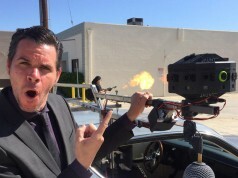 YEI is now showing a zombie shooting game in use with the system (you can see some clips of the non-Rift version of the game here). I strapped on the upper body PrioVR suit to give it a whirl. Latency feels good, and being able to see the articulation of my hands, arms, and entire upper body takes us one step closer to the full immersion that we crave. The idea of being able to put this system on and run/duck/dodge in a huge open (real) environment is extremely exciting. I hope they put up more information and videos about it in their next kickstarter and I wish them success as I think this sort of body tracking system is needed in VR. I just wonder if it’s a little early in the VR game to be attempting this… People need to get their VR legs under them and although we all want the best possible experience and equipment I think there will be much better tracking equipment in the years to come… I think ultimately you will have a body suit which will track your entire body including all your fingers and it will be just like putting on a comfortable fitted pant/shirt/glove combo. I really hope they ship the dev kits with some out of the box software experiences like Oculus did with the Tuscany and the Unreal samples. Holsters are a great idea! However, I’m not sure how the game would know when they are holstered vs held. Great to keep hearing about them, I’m really looking forward to their kickstarter relaunch. I hope they make it this time. Here’s hoping they release a glove at the time of the suit! I still can’t believe we haven’t seen at least a prototype of an affordable VR glove.